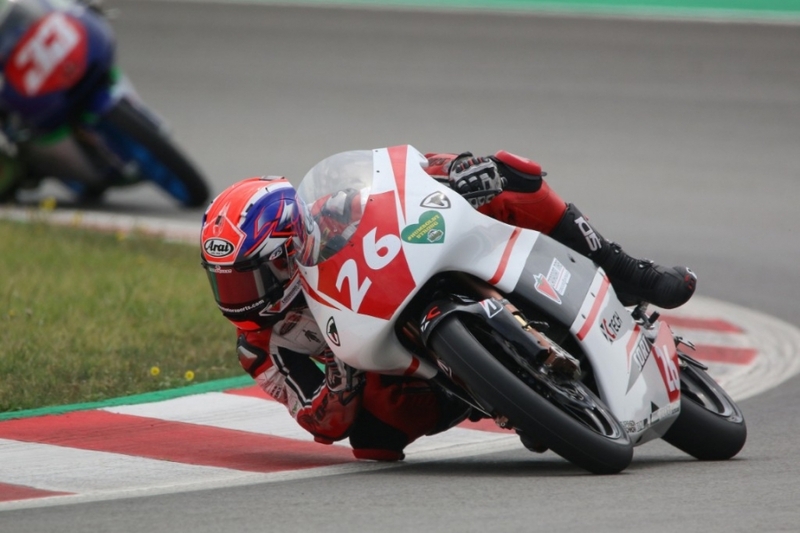 Persevering in the face of adversity was a recurring theme this past weekend for the 14-year-old Canadian RFME PreMoto3 Championship rider Jonathan Finn, who finished 16th in Sunday’s race. Finn’s misfortune continued a few laps later when he tried to draft pass going into the first turn. “I was able to get utilize the draft and I wanted to slingshot my way to the front of the pack going into turn 1. I knew my sector 1 times were faster than the other riders in the group, so I wanted to be leading the group going into the first turn.” Said Finn. “Under heavy braking I got really loose and I had to overshoot the corner and use the paved runoff.